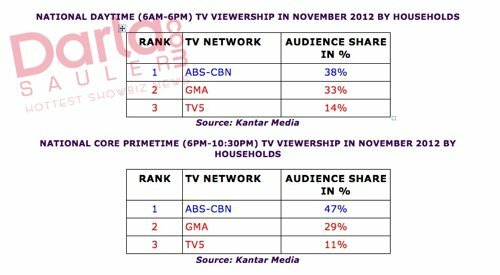 ABS-CBN rules National and Primetime TV Viewing in November 2012! ABS-CBN Corporation, the country’s largest and leading multimedia conglomerate, continued its lead among urban and rural households in the country for the month of November with a total day average national audience share of 41%, or ten points higher than GMA’s 31%, based on data from Kantar Media. ABS-CBN also won on core primetime in other territories such as Total Luzon, which includes Mega Manila, with a 42% audience share vs GMA’s 33%. In the Visayas, ABS-CBN pulled away with a 53% audience share vs GMA’s 26%, while in Mindanao it peaked at 59% or three times bigger than GMA’s 19%. Out of the top 15 regularly running programs, ABS-CBN grabbed the 13 out of the 15 spots and captured the top 10. 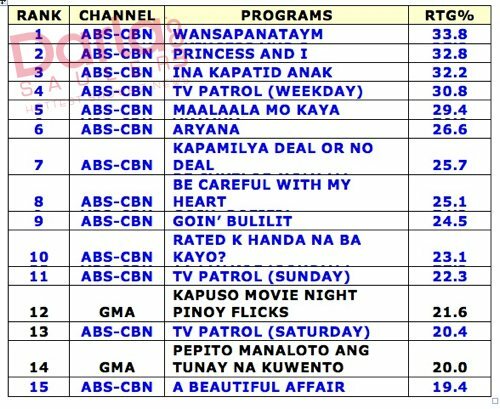 “Wansapanataym” soared high and led the pack with a national TV rating of 36.4%, while “Princess and I” remained strong at 2nd place with 34.2%. Most Filipinos also watched the special airing of Zoren Legaspi’s surprise marriage proposal and wedding to host-actress Carmina Villaroel in “Zoren-Carmina Always, Forever: A Wedding Like No Other,” which aired last November 24 and hit a national TV rating of 22.8%.